This vintage Japanese poster shows a brown demon weilding a katana sword. These demons are known in Japanese folklore as an Oni. 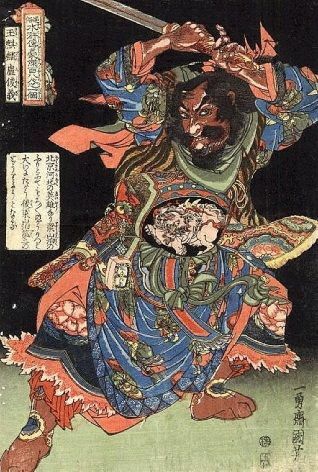 Oni are a kind of yōkai from Japanese folklore, variously translated as demons, devils, ogres or trolls and can often be terifying creatures. They are popular characters in Japanese art, literature and theatre.